My aim with Toddler Basics is to focus squarely on the one to four year-old and to concentrate on the basics of their care. As little human dynamos who are new to the world, one to four year-olds are always on the go. They require lots of supervision and nurturing. Looking after them isn't easy. If you're a toddler parent, grandparent, aunt or uncle you'll already know it's a daunting task. In the site you will find practical information and tips on the raising and nurturing of toddlers and helpful descriptions on the gear and stuff you need to keep them happy and content. From the practical aspects of their safety, entertainment, development and learning to the assembling of all the paraphernalia they need in terms of car seats, strollers, toys and furniture. - Toddler safety: the common causes of child injury and preventative steps that can be taken to avoid them. - Car seats: legislation and recommended seats for the age, weight and height of your child. - Activities: indoor and outdoor play activities to keep your youngster engrossed, entertained and out of mischief. - Games: suggestions for toddler board games, party games, computer and online games. - Toys: a toy benefits checklist and the common categories of toys such as educational, activity, electronic, learning and outdoor. - Eating: encouraging good eating habits, non confrontational eating, set meals and in between snacks. - Nutrition: guidelines for a healthy diet and the food pyramid. 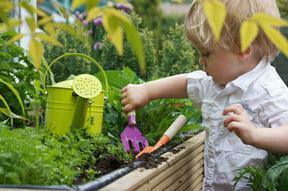 - Teaching: teaching toddlers the easy way by doing it naturally. I have been a grandpa for three and a half years. I have a grandson that age and a granddaughter who is 15 months old and just toddling. I am fortunate to be living with my grandchildren and have ample opportunity to watch their antics, play and development. It's a never ending voyage of discovery. I hope you enjoy the site. It will be added to and updated regularly over time. Please visit often and let me know what you would like to see via the contact page. © Copyright 2009-2010 ToddlerBasics.com. All Rights Reserved.